Hey gang. Last week I was contacted by Ask Your Dad reader, Caleb Kaminer. 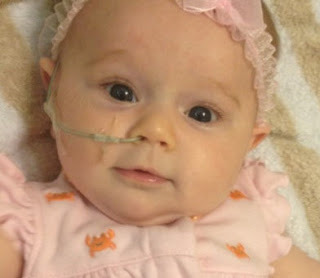 His adorable daughter, Tristan, has a disease so rare that it doesn't even have a name. Basically, everything she eats or drinks goes into her lungs instead of her stomach. They've been working with doctors around the country to try and find a cure. Here is their story. For this week's Five Dollar Friday, I chipped in to help Caleb and his wife pay for their mounting medical bills. So far, they haven't reached their $10,000 dollar goal. Let's see what we can do to help them continue to work to find a cure for their adorable daughter. Sharing their story helps just as much as chipping in. Thanks for your help! Have a great weekend! If you know of a charity, organization or cause that we can feature in an upcoming Five Dollar Friday, please contact me with the subject line "Five Dollar Friday". I'm sorry, but I'm not able to feature or reply to everyone. Everything goes into her lungs (down the tracea) instead of the stomach (down the esophogus), right? Man... I have a friend who also has a child with a neurological disorder... no one knows why she has seizures. :( Testing like crazy for years. Yes. I wrote it backwards at first. Typo fixed. Thanks J.! PANDAS causes seizures and is really undetected by the medical community.